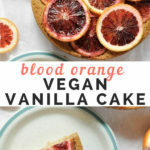 Making a blood orange vegan vanilla cake is a great way to impress your friends and family without actually putting in too much time or effort. 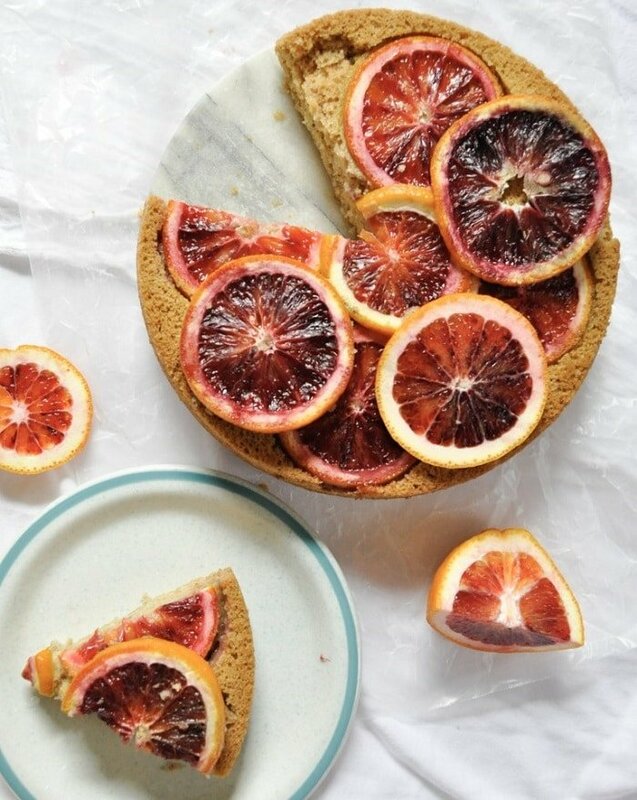 Combing sweet vanilla cake base with tangy blood oranges is the perfect way to jazz up your dessert! Blood oranges are all the rage in winter time, but for some reason I associate them with spring. It must be that fuchsia (blood?!) hue that makes me feel like the cold is about to melt away and the flowers are about to bloom. Wishful thinking? I hope not. Since the sun is finally starting to shine in Portland, I’m wrapping up my deep winter recipes and starting to put a springy twist on things. I’m fully aware that any minute a gray cloud could pop out and cover up the sun, but in the mean time I’m ready to pretend like it’s spring and add fruit to everything. Because spring time = fruit time, right? 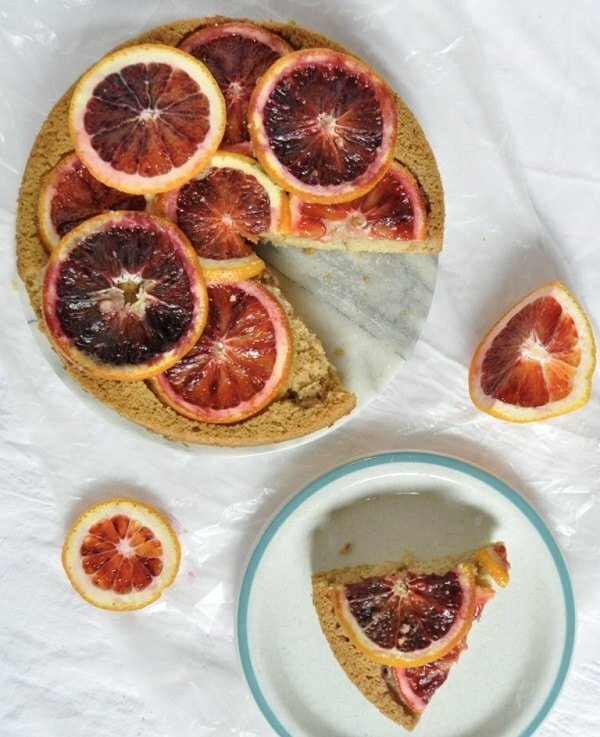 An aside: am I the only one who sees raw blood orange slices, peels included, on food and freaks out a little bit? Like, you can eat an orange peel?? 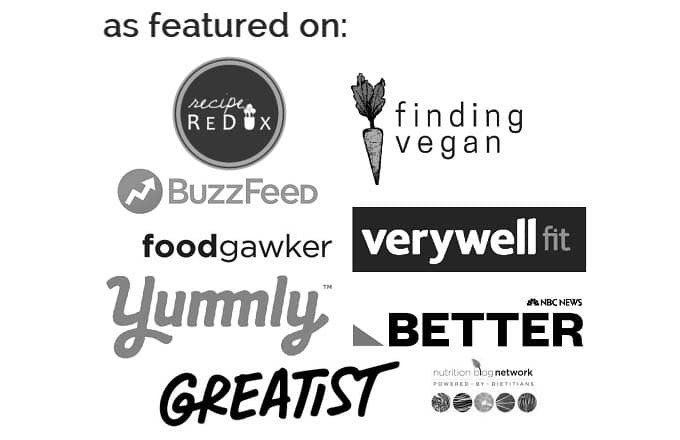 Turns out it’s totally okay, and actually a great source of fiber and vitamins. Once you move past the slightly bitter taste, there’s some lovely flavors to take in. The oranges in this recipe are cooked, of course, which makes the peel much softer and less bitter. I’m all about adding fiber into my desserts, and this time I did it with orange peels! The key is to slice your blood orange thinly, or at least about the same width each time. The oranges are arranged at the bottom of a 9×9 cake pan, then covered with the batter. If you’re worried about the cake sticking you can cut out a piece of parchment paper to line the bottom of the pan, but every time I’ve tried it with just a thin layer of oil and a relatively unmarred non-stick cake pan, the cake falls out just fine. And I sigh a deep sigh of relief! 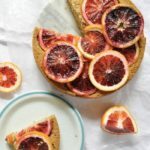 I love that this blood orange vegan vanilla cake can be put together in under fifteen minutes and baked in just thirty. I’m not going to say you should make this every week (after all, there’s so many cake recipes out there! ), but you may want end up wanting to do just that after you take your first bite of this cake. 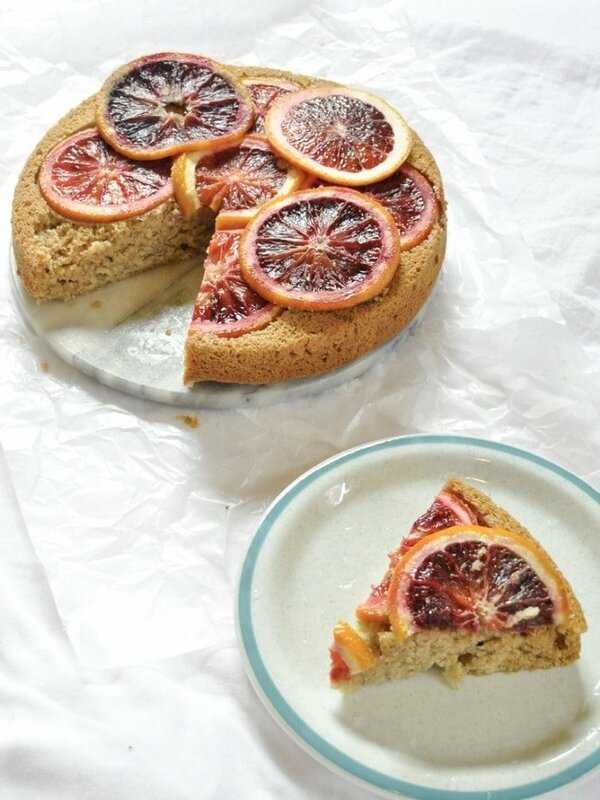 Light and fluffy vanilla cake with blood orange slices. Preheat the oven to 350 degrees Fahrenheit. Grease one 9 x 9 inch cake pan with nonstick cooking spray. Thinly slice one of the blood oranges into nine slices. 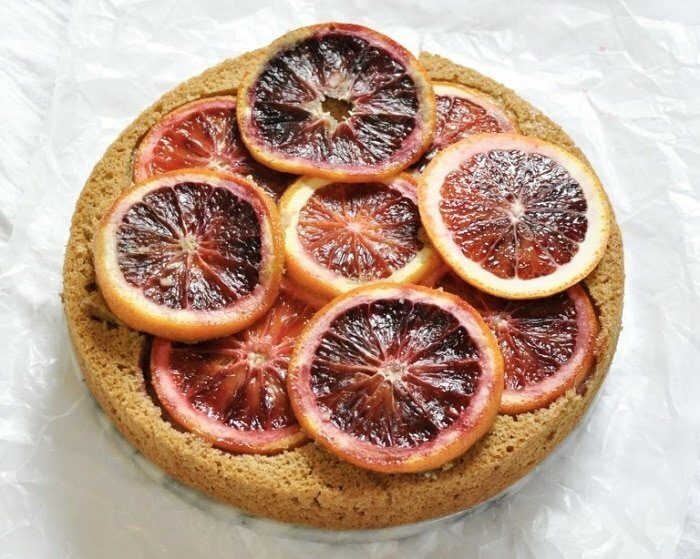 Layer orange slices in the well oiled cake pan (see pictures). Set aside. Juice the second blood orange. 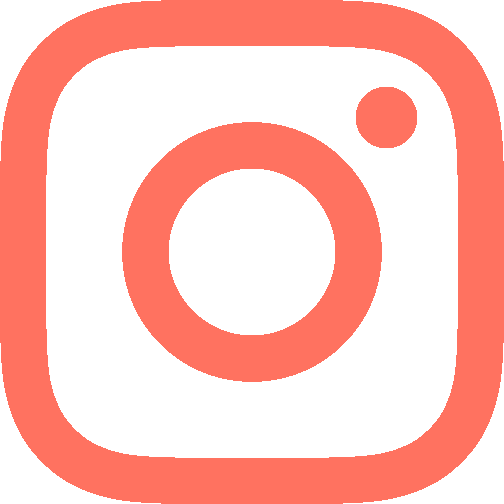 Set juice aside. Combine flour, sugar, baking soda, salt, cinnamon, and nutmeg in a medium mixing bowl. Stir together. Add in the non-dairy milk, canola oil, two tablespoons of blood orange juice, and apple cider vinegar. Stir until combined and no dry clumps remain. Pour cake batter evenly over the blood orange slices. Bake for 30 minutes. Your cake is ready when a toothpick inserted in the center comes out clean. Let cool in tin for 5 minutes. Gently turn out onto cooling rack.